"Mama, look at her. She's MAGICAL." Mags has been preparing for her recital for months. The dance steps, the costumes, the ballet bun...it's all very exciting. But her shining moments don't come in her own dances. They're fantastic, don't get me wrong. That girl can smile the smile and shuffle the shuffle. 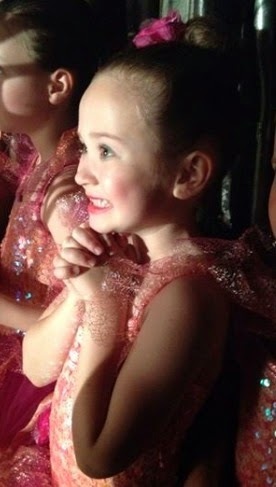 However, the moments that make this girl light up come when she's inspired by the "big girl ballerinas." They're beautiful. They wear stunning, poofy-skirted costumes. They dance on their toes. They are doing what she hopes to build up to in dance. But tonight, there was one. One of those ballerinas, one of the sweetest, ran off the stage in a transition point of the dance. While she was waiting in the wings, she looked over, saw my Mags waiting against the wall, and I watched both their faces light up. "Hi, Maggie." she mouthed and waved at her. Mags looked at me with such awe that, during the middle of this production, her big girl idol would be so excited to see her. That this budding pointe dancer took a moment to INSPIRE a younger dancer left me breathless. And as she arabesqued back onto the stage, I turned just in time to capture the moment in a picture. Mel's Twitter post on 5/5/14: "The only day it's perfectly acceptable to roll over, kiss my husband and whisper another man's name. #JackIsBack"
Tuck, our oldest, was 3. Mags, our youngest, was 1. On most days I was up early and out the door to work. Melissa worked from home during the day, fitting in odd jobs, completing household errands, coordinating play-dates, and doing everything else that needed to be done. At 3:30, the roles reversed. Sometime in the morning we compared schedules and picked a spot to meet to swap the kids. In school, church, or store parking lots (or even, sometimes, just on the side of the road) we met to flip the kids from one set of car seats to the other. Melissa headed off to work, mostly, at the time, to tutor students. I assumed the parenting responsibilities of dinner, clean-up, bath, reading, and bed. Melissa would get home around 7:30, often just in time to give the kids a kiss goodnight. At 8pm, I’d march myself into the bedroom, close the door, and work until 11. Every. Single. Night (including weekends). I was contracted to co-author a book on the topic of building a successful Assistive Technology program. The project consumed almost every evening for a better part of 9 months. The title of the book was The Practical (and Fun) Guide to Assistive Technology in Public Schools but Melissa affectionately gave it a different title. She called it our “third child." The work was incredibly rewarding but very time consuming. The book never impacted the time spent with the children but it had a devastating impact on the time spent with Melissa. Needless to say, “absence makes the heart grow fonder” won out over “out of sight, out of mind.” The lack of time only strengthened our relationship. We learned how valuable our time together was and found ourselves longing for more of it. We missed laughing together. We missed eating together. We missed sharing our thoughts on pop culture and current events. We just missed being together. We resolved to rectify that situation as soon as I was finished with the book. When the book was completed, with the final draft sent to the publisher for editing, we decided one way we could reconnect would be to simply snuggle up on the couch and watch a television show. Most take the time spent together watching television for granted. For us, it was a luxury we hadn’t indulged in for almost a year. The show we chose to watch was the one everyone was talking about everywhere; 24. We ordered Season 1 on Netflix and fell into the world of Jack Bauer and CTU. It turned out to be the perfect show for us. The show featured just the right mix of action, adventure, excitement, and intrigue. At times, we found ourselves gasping in shock and shouting at the screen like we could somehow impact the outcome of the events. At other times, we found ourselves cracking jokes, making up our own dialogue, and laughing at ridiculous predictions that remarkably came true in the plot. We discussed refreshments for our nightly viewings, usually trying some new appetizer or drink to accompany our viewing pleasure. We snuggled up, just enjoying the close proximity. We howled, cheered, cried, laughed, and lounged reveling in the time together. for giving us a vehicle with which to hone our witty repartee. When 24 ended, we were sad. We missed rooting for our buddy, Jack. We missed talking like Jack, Chloe, Tony, and the other characters from the show. We missed poking at the dialogue, mannerisms, and outrageous plot twists. Mostly though, we missed the fun we were having simply being together. We tried to fill the void with other shows, looking for the right mix of character, story, action, drama, and humor. Shows like the John Adams miniseries, Battlestar Galactica, Nip/Tuck, and Arrested Development all had their merits. We watched them all from start to finish. We enjoyed our time with these shows too, but none captured our attention like 24. 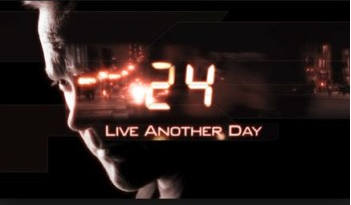 Now, 24 has returned for a 12 episode season called Live Another Day and we find ourselves falling right back into our old routine. We’re sitting, snacking, snickering, and snuggling our way through each episode...and loving the time we’re taking to just be together. Although we have ambitions and goals, both personal and professional, we’ve embraced the idea that these are really secondary aspirations. First and foremost, we need to be happy. Dammit people, we hope you’re having just as much fun as we are! Me: "Tell me all about your field trip!" Mags: "Well…let me start with the most EXCITING part." Mags: "The bus had a BATHROOM!" Mags: "Yes way. It was a FANCY bus. AND I used the bathroom TWICE." Me: "How was it? Fancy?" Mags: "Sorta. The first time I went in there it smelled like cotton candy. The second time I went in there…it smelled less like cotton candy and more like…poop." Mags: "It's okay. It was still fancy. Just a smelly fancy." Mags and Chris went on a field trip. What's not to love? My favorite shot that he took today. Mags: "You want me to do what?" Me: "Use your foot like this to flush the toilet." Mags: "Are you crazy? My legs don't stretch that far." There's an unspoken rule in dirty gas station, highway rest stop, WalMart or grocery store bathrooms. At least for women. Always flush the soiled toilet handles with your foot. So, today, like any other normal day in a public restroom, I performed my trick. Except my phone began to ring JUST as I poised my foot. I looked down, only for a second, while my brain simultaneously pushed in a familiar downward motion. I was jolted forward, as I heard the flush, but it didn't register until I heard, SPLASH! I looked into the toilet in disbelief. There. Was. My. Foot. Becoming surrounded…and wet…by the fresh water that replenished the bowl, I lifted up as fast as I could. Cute, cork wedges do not have the sturdy platform needed in order to remain securely on the flush bar for the entirety of the force placed upon it.